Bay Area Rapid Transit or BART, is a regional heavy-rail system serving the East Bay, San Francisco, and Northern San Mateo County. 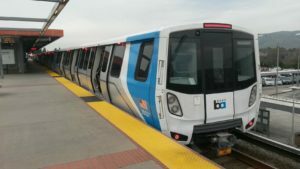 BART provides an alternative to commuters in many cities in Alameda and Contra Costa County to driving to San Francisco and within the East Bay on congested freeways, including the Caldecott Tunnel and the San Francisco-Oakland Bay Bridge. Since the completion of the Transbay Tube in 1974, BART has always been a popular and rapid form of transportation between the East Bay and San Francisco. BART provides direct service to San Francisco and Oakland airports, Downtown San Francisco and Oakland, and the University of California at Berkeley, as well as cross-platform connections to Muni Metro in Downtown San Francisco, Amtrak in Richmond, and to Caltrain in Millbrae. 46 Stations in Alameda, Contra Costa, San Francisco, and San Mateo Counties, which include 17 surface, 14 elevated, and 15 subway stations. 6 Lines. 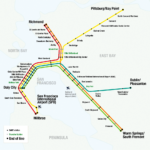 3 lines (Red, Yellow, and Green Lines) run from Daly City through San Francisco via the Transbay Tube to Richmond, Pitsburg/Baypoint, and Fremont, respectively. 1 runs between Dublin/Pleasanton and Millbrae via the Transbay Tube to San Francisco International Airport and Millbrae (Blue Line). And 1 runs solely in the East Bay between Richmond and Fremont (Orange Line). 1 route between Coliseum and Oakland Airport. BART is a three-county (San Francisco, Alameda, and Contra Costa) special district and it is governed by the BART Board of Directors. The BART Board is consisted of nine elected directors each representing an electorial district. Some of the districts span across county lines. Although BART service covers 4 and eventually 5 counties, the two counties (San Mateo and Santa Clara) chose not to join the BART District. These two counties financially support BART with locally controlled funding sources and has cost sharing agreement with BART on capital and operational needs. Operational funding for service within the three-county BART district is provided by half-cent Sales Taxes in each of the three counties of the BART district. Riders contribute more than half of the operating cost through fares and parking fees. 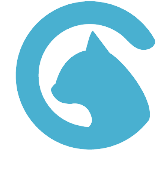 Capital funds come from a variety of sources including bridge tolls and bonds. After 45 years of service, the BART’s core system is aging and at capacity. Its cars are also aging and in need of replacement. The system struggles to operate efficiently without cutting service, but while raising fares. The system is expensive to operate. BART has a unique 5′ 6” rail gauge while nearly all other railroads, including light rail and commuter rail run on a standard 4′ 8.5” rail gauge. Therefore, BART is incompatible with other rail systems. Only BART trains can run on BART tracks and BART trains cannot run on other railroads. 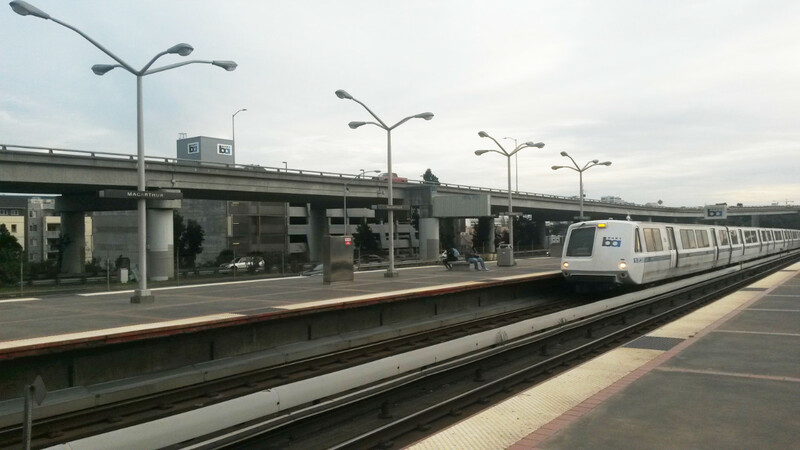 For many years, BART has expanded service outside the urban core that was less than successful, including the recent extension from Colma to San Francisco International Airport and Millbrae. Ridership on that extension is less than half what was projected and has made trips between SFO and Caltrain much more cumbersome. We believe that BART technology is not appropriate for expansions in suburban areas and that BART should focus on enhancing service in core areas such as Oakland and San Francisco. BayRail is against the extension from Fremont to Berryessa, which is being built by BART (from Fremont to Warm Springs) and from VTA (from Warm Springs to Berryessa). We do not believe the extension will meet the project ridership. We are particularly concerned about further extension beyond Berryessa because we are doubtful that VTA has the financial resources to successfully build and operate the planned extension while preserving and/or expanding existing bus, light rail, and commuter rail services. Since voters approved funding for the project in 2000, VTA significantly reduced bus service throughout the county.